The red dusty dirt invites pilgrims like me to experience at a cellular level the truth that we are simply dust. I am dust, rich as this land. I am dust, buoyant as the particulars soaring through the air on an African breeze. Thank God for the witness of fellow dirt lovers in Rwanda that have taught me this week that being dust is a gift. Together we will continue to author a story of love from the fields with a fairly simple plot: buy the oils, love the land, sustain the farmers, heal the world. 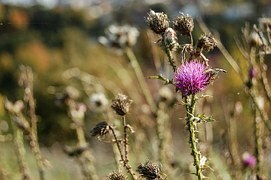 We need all the great Thistle Friends to help this field flourish. With that, all I have is love and gratitude for friendship today. The word Ikirezi means “precious pearl” in the local Bantu dialect where the organization, of the same name, was founded by Dr. Nicholas Hitimana in 2005 and employs women in Rwanda to harvest geranium. When I think about the impact Ikirezi has had locally with 80% percent of its employees being orphans and widows of the 1994 Rwandan Genocide which resulted in the deaths of an estimated 1,000,000 million people, I am humbled. When I think about the impact this organization has had on Thistle Farms, as one of our Shared Trade partners and suppliers of geranium oil, I am called to continue proclaiming the truth that we are all beholden to each other as global citizens and part of a family greater than ourselves. Nicholas has become a close friend of mine. I am inspired by the love he has for the women of Rwanda and the world. A woman from Ikirezi and Thistle Farms share practices. On Thistle Farm's third trip to visit the Ikirezi community, Nicholas told me that our ecommerce partnership was important, not just because of the added economic value, but because it was a reminder that he wasn’t alone in this work. What he meant was that despite the overwhelming obstacles one faces in justice work out in the fields, we can overcome our times of loneliness and heartbreak if we work together. I feel similarly when I think of Nicholas and Ikirezi. Making global friends and hearing the healing stories of women in Rwanda, it makes me feel stronger in my work here in the US. I am comforted by the promise that I am not alone. I have a network of survivor leaders all over the world who are part of our local efforts through the Shared Trade network of people. We are not alone, and we will continue the work of telling women all over the world who have been trafficked that they are not alone either. Such knowledge as this is a precious pearl, and I carry it in my heart, always.